Hurdle hops and extended bounding are great exercises to develop elastic strength and elastic endurance respectively. Most of the time those exercises are misunderstood and ill prescribed. Both exercises are advanced exercises though one can construct a progression using exercise that mimic and teach them in a progressive and safe manner. Most of the material presented here are strongly inspired by Dan Pfaff and Boo Schexnayder. I thank warmly Coach Schexnayder that had the patience to answer many of my questions. Because the plyometric progressions are usually known or at least available on the internet, I’ll try to focus on practical details of implementation. From my point of view, they often more important than the workouts themselves. Moreover, it’s very important to have a periodic technical progression for all the component of the training plan in order to have a sound planning of skills acquisition. It is, of course, not sufficient to jump far and high, sprint fast, but it is necessary. Hurdle hops are just two legs jumping over a series of obstacles usually hurdles. Obstacle is actually the wrong word since the purpose of this obstacle is not to be an obstacle, but a guide that control the height of the jump. Depending on the height of the hurdle those exercises can be more or less intense. The key variable to consider while doing hurdle hops is thus the height that control tension in the muscle and connective tissues as well as ground contact time in more advanced exercises. An auxiliary variable is the spacing between the hurdle. The spacing control the mechanical orientation of the jumps that are more or less vertical. Finally, the type of exercises determine the type of skills that one want to develop. Extended bounding are unilateral or alternate type of bounding made over extended distances usually more than 30m. Their purpose is to learn how to sustain an impact when fatigue settles and develop what is called elastic endurance capabilities. 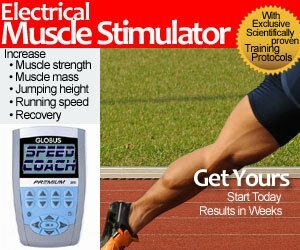 They are the most useful for long sprinters and hurdlers. The key variables are the type of exercise and the total distance. The type of exercise determines the tension in the muscle and connective tissue and the total distance determines how long the muscles can sustain this tension. Hurdle hops are a moderately to highly taxing to the central nervous system. They also demand a lot of coordination. Proper posture and amortization are key. Some prerequisites are mandatory to ensure safe execution. Posture and amortization should be taught first. They can be taught using two legs bound over wicket, cones or short hurdles (progress in that order). One can start with bounds with a stop (called singles) over 10 meters with a wicket every 20-30cm. Those singles can be executed with or without a countermovement jump. It’s more logical to start without a countermovement to teach proper body position. The focus is on posture, flat foot landing and proper yielding at the waist knees and ankle during propulsion and landing. Their position at the end of the landing part should be roughly the same that at the beginning of the jump. If the posture is an issue, one can thing of doing the jumps with the hands on the head or a broomstick on the shoulder (a nice idea stolen from Kenta Bell). Then when mastery of the exercise attains roughly 90% of perfect execution one can proceed to doubles (two jumps in a row then a stop), then triples then continuous bounding. Usually, when you reach 90% of mastery in one exercise it’s time to either start a more complex exercise or to go back to the previous exercise. In the latter case one usually observe an improvement over the previous mastery level. Then one can use cones, then short hurdle and repeat the progression. The tension will progressively increase, and the body will adapt and stabilize safely. 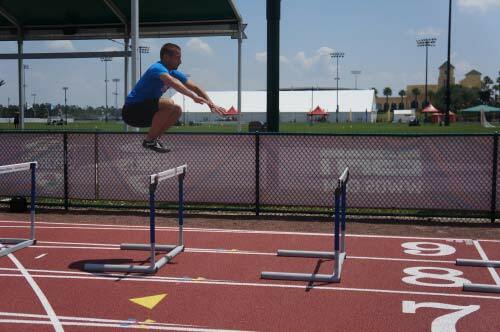 For more advanced athletes that already have mastered those skills they can use actual hurdles. The main purpose of hurdle hops is to develop amortization and elastic strength, but a little propulsive component can be added to it by using single without countermovement. The progression is usually the same as before. Concerning the height of the hurdles one should be conservative here particularly for the continuous jumping (without any stops). What counts is the ground contact time. For sprinters, the height should be short so lower hurdles are preferred, for jumpers higher hurdle can be used. Typically for sub 12 sprinters the lower heights (60-76cm) are appropriate. For Jumpers, 84-90cm are more appropriate. Of course, you can increase the ground contact time to add a strength component to the exercise. But care must be taken here since most athletes will tend to raise their knees forcefully instead of “propelling” themselves with a good jumping mechanic. Height should, of course, be individualized. For example, I’ve noticed that gifted athletes raise the center of mass higher when using lower hurdles (they are lazy to raise their knees), so maybe 76 cm hurdles is plenty for them.The spacing is used to ensure proper mechanics. I’ve noticed that with shorter spacing athletes tend to raise their knees too much, and posture issues appear leading to poor landing. I usually use 4-7 feet spacing. The larger spacing 7 feet are just to add a horizontal component to the jumps and are more rarely used. – 6-8X4 (with a stop-or double) : height 60cm, spacing 4-5 feet. – 6X4 hurdle hops, height : 76cm-84, spacing : 5-6 feet. Miscellaneous: Hurdle hopping is really a great exercise when done correctly. I’ve noticed more than a couple of times that it can be used even if the athlete has a torn hamstring. In many cases, hurdle hops can be resumed long before actual sprinting. It can serve to feed the nervous system and minimal to no speed loss occurs.